Hollywood & Vine at Disney’s Hollywood Studios, isn’t where the stars go to dine and rub elbows, unless you are looking for the characters taking part in Minnie’s Seasonal Dinner Dine (more on that in the future). Its garish neon sign pushes back all the signs of this being an old diner, complete with plate windows and metal framing on the outside. Once inside the restaurant, this buffet is bookended with decorations meant to solidify itself as a hub of Hollywood tourism. Oversized postcards depicting famous landmarks cover one wall while maps denoting famous locations around town adorn the opposite wall. It’s this map work that concerns us today. Here, just near one of the Cast Members service stands, is a section of map depicting the Burbank area. Tucked away between San Fernando, Riverside Drive, Alameda, and Buena Vista sits a drawing of a few small buildings, tree-lined avenues, a water tower, and a soundstage all overseen by a sun-soaked cloud. The arrow pointing to this scene is scrawled in someone’s best attempt to copy Walt’s signature, not to mention their sketches of Mickey Mouse and an animator at work, but states this is the Walt Disney Studios. 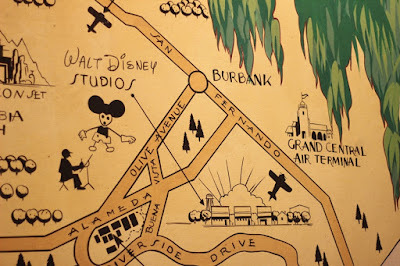 This map clearly comes from sometime after Walt and Roy moved the studio and their workforce to the Burbank location in 1940. Prior to this move, the Disneys had worked out of several spaces on Kingswell Avenue in Los Feliz and later on Hyperion Avenue in Silver Lake. Hyperion was where Disney developed some of their most groundbreaking work, including the multiplane camera, the first feature length animated film, Snow White and the Seven Dwarfs, and, most importantly, the development of Mickey Mouse. Just about everything else we know and love Disney for, however, came out of the Burbank location. That doesn’t mean that the studio forgot about its roots, as a bungalow from the Hyperion site was moved to the Burbank lot during the construction of the new studio. Built in large part because of Snow White’s success at the box office, the Burbank facility was specifically designed around the needs of animators and for the animation process. As years went by and live action became more of a focus, soundstages and exterior facades would pop up around the lot. While there were changes to the studio over the years, the most massive of which came in 1992 with an expansion that included additional facilities for ABC. Zorro, Mouseketeers, Fantasia, Mary Poppins, and more animated features than you can name came from this hallowed ground. Seems fitting then to give the Burbank lot a place on a map, inside of a restaurant, that’s part of a park which celebrates all things Hollywood, doesn’t it?